The U16 Girls entered the Ontario Cup Provincial Championship in Division 6 (out of 8) seeded 4th of 8 teams with a 10 win and 6 loss record. With only 9 players and not blessed with a lot of height the girls needed to play together as a team to play pressure defense and score in transition by running the floor. After a close fought first three quarters with Huntsville down 28 to 27 they outscored the local Ottawa team 16 to 6 and won by a final score of 44 to 33. Huntsville was led by Riley Truax with 24 points, Jenna Yeo with 9 rebounds and Morgan Smith 4 assists and 3 steals. Again the game was close with both teams going back and forth through three quarters with the Hurricanes leading 28 to 26. This time the Huntsville squad was tired and were outplayed by their larger opponents in the 4th quarter and eventually losing 40 to 31. Huntsville was led by Jenna Yeo with 15 points, and three players (Yeo, Smith and Zoe Long) with 10 rebounds each and Truax with 4 steals. Needing to win to advance to the bronze medal game the Hurricanes and Guelph teams were close again through half time with Huntsville leading 30 to 27. In the only game of 16 in the tournament decided by more than 9 points, Huntsville pulled away with relentless defence to win 65 to 49. Truax led the way with 26 points, 6 assists and 7 steals, Yeo had 13 rebounds and 11 points while Long had 11 rebounds and 6 assists and Maggie Pitts with a season high 9 points. While every other team had between 10 and 14 players the undermanned and undersized Hurricanes were struggling to have enough energy with only 8 players for their 4th game in 48 hours and trailed by 5 entering the 4th quarter. With incredible intensity highlighted by a relentless full court defence for the entire 4th quarter saw the Hurricanes, at one point, score 3 baskets on turnovers, in an incredible 10 second period. 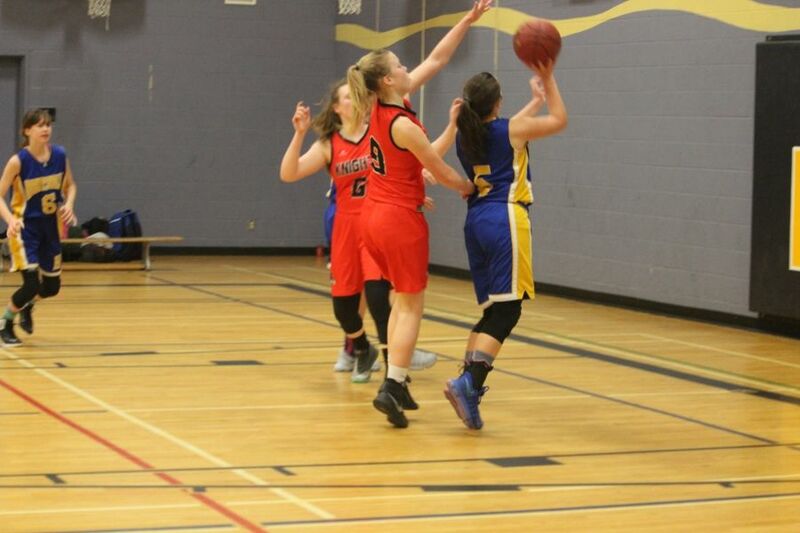 Dundas wouldn’t give up but the Hurricanes held on to win 64 – 57 despite Truax and Kaiya Roberson fouling out with 2 minutes to go and Huntsville only up 2 points at the time leaving Hurricanes with only one eligible player on the bench. The final game of the season was the best example of “team” of the year. Six of the eight players scored at least 7 points led by Truax with 14. Every player had at least one rebound with 7 players gaining at least 4, led by Yeo with 8. Incredibly the team had a season high 20 steals to win the bronze medal. The ultimate team effort included all eight players.